Changing the course of one’s life is never easy, but, in the spring of 1988, Karen, along with five jazz musicians took the first step. Armed with one English/Greek dictionary amongst them and a 4 month contract to perform on-board a cruise ship as it sailed the Mediterranean and Aegean Seas, they boarded an Olympic Airlines flight at JFK and headed to Athens, Greece. “When I stepped off that plane in Athens into the sweet lemon smell of a Greek spring, I looked up at those beautiful green mountains, felt the sea breeze on my face, and said to myself, ‘I am home.’ The noise, the disorganization, the traffic congestion, the crazy drivers, the pollution, and the chaos that others complained about was not what I saw. I found everything about this new experience stimulating and exciting but it wasn’t easy. Adjusting to a new culture with entirely different ideas and attitudes takes time. Living on a ship was challenging. The European passengers and Greek crew were not enthralled with our American jazz so we adapted our repertoire to meet the needs of tea dances and after dinner entertainment. In other words, we turned our faces to the wind and embraced the journey. Unfortunately, two months into the cruise, the shipping company suffered financial problems, and the ship went into dry dock in Athens; our four-month contract was broken. As a result, five American musicians returned to the States — without their lead singer. In a manner of speaking, I had jumped ship. It was up to me to choose whether I was going to sink or swim in this new place. At the very least, I chose to make it a great adventure,” smiled Karen. “From my verandah, I saw the sea melt into the horizon, an endless expanse of blue and white. The traditional Mykonian house was made of stone and surrounded by fields of wildlflowers populated with goats and sheep. Like my neighbors on Mykonos, I soon learned to celebrate the pink and gold burn of an Aegean sunset every evening, and fall alseep to the tinkling of bells and the chatter of birds. “This exotic little island, the kindness of the people and the charming culture of Greece swept me off my feet as surely as any love I had ever known…following my heart had led me to an island in the Aegean Sea. Whenever I was asked how long I would stay, I replied that I would be in Greece until I knew it was time to leave. In December of 2013, Karen closed a life of 25 years in Athens and returned to Louisiana to care for her aging parents. From her home in West Monroe, where she enjoys time with her mother when not teaching at River Oaks, working with the Strauss Little Theater or giving vocal lessons at SYAA, Karen was nice enough to not only share her love for Greece but to give me some travel tips for those wanting to visit the country which captured her heart 3 decades ago. Be prepared to embrace the differences of a culture that is thousands of years old. Greeks are a passionate people with strong traditions. This is a country living for centuries at the crossroads of Eastern and Western civilizations. Expect and respect this uniqueness. Athens is a city of charm and chaos. This contrast creates an atmosphere of relaxation and liberation that seduces the visitor in a very unconscious way. As surely as there is the constant potential for disaster there is just that much potential for adventure. The challenge for the tourist is to balance these elements from moment to moment. Mindfulness and a positive attitude go a long way toward navigating the events that can create a successful or stressful holiday in Greece. Visitors to Greece need to be aware that things are not always as highly organized and well-planned as they are in one’s native country. Sometimes, life just runs on “Greek time.” They are such a “chilled out” people. The Greeks often communicate differently from us. They speak loudly and very often sound confrontational. Yet, in the next minute, they are laughing just as heartily. Abundance in Greece is often measured by quality of life rather than quantity of money or material possessions. The first thing a Greek said to me was: life is short, make it beautiful. Food is a celebration and a reason for being with family and friends. A night around the table can quickly escalate into group singing and energetic dancing. A simple meal at the local taverna or a walk by the sea at sunset bring enjoyment and satisfaction to a people who live passionately and authentically every day. The Greeks are open-hearted and philosophical, opinionated and emotional, kind and proud. “Greece is an extremely popular destination for us at Monroe Travel Service this summer. Do you have a “must do” list?” I asked my friend. Don’t miss the sunset celebration in the village of Oia on Santorini! In Mykonos, the best sunset is in the window seat over the water at Kastro Bar in Little Venice. 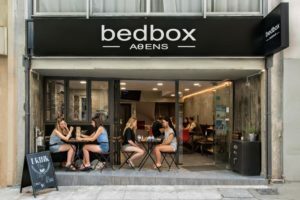 In Athens, the Hop On- Hop Off Bus is a fabulous way to see most of the historical sites, plus, the Athens Happy Train goes all through the Plaka, one of the oldest and most charming neighborhoods in the city. Agora market is a chance to see some true local culture. For traditional Greek dancing visit the Dora Stratou Theatre located on Phlilopappou Hill opposite the Acropolis. The Athens- Epidaurus annual arts festival runs from May to October and includes musical, theatrical and other cultural events. The performances are staged in and around Athens, most notably in the Odeon of Herodes Atticus near the Acropolis and at the ancient theatre of Epidaurus which is renowned for its exceptional acoustics built into the original 4th century BC design. 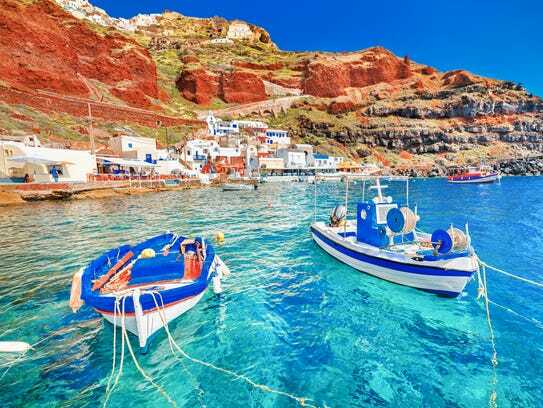 Almost everyone wants to see the breathtakingly beautiful islands of Mykonos and Santorini, but if you wish to get away from the crowds, take the ferry to Crete, Paros, Patmos, or Hydra. For the “green or eco -minded tourist” there’s The Red Tractor Farm Guesthouse, part of an environmentally sustainable project of Greek island farm tourism located on the island of Kea. Also available are many walking, sailing, cultural and cycling adventures that explore the less commercial aspects of a visit to Greece. “Holistic holidays” can be found on both the mainland and islands. The Thermae Sylla Spa and Wellness Hotel in Evia, Healing the Heart Meditation Retreat in Ithaka and Anazoe Spa in Costa Navarino are only a few of the offerings. One of the most unique places in this amazing country is Meteora, a formation of rock towers where 600 year old Orthodox monasteries are built into the top of the rocks. There are thousands of islands and 8000 miles of coastline along the Aegean and Ionian Seas to enjoy, so go exploring! Plan on eating well..never seeing a cloud from May to September… enjoying great weather, amazing sights and unforgettable colors in a relaxed destination with some of the kindest and most fun-loving people you will ever meet. If you want to check out this land where democracy was conceived and the views are picture post card perfect, then give me a call at Monroe Travel Service-323-3465–and let’s discuss your travel style. Like Karen Solomon, be fearless, and who knows? Maybe Greece will win your heart, too!